Many may think that this traditional Roman Mass, from the 1962 Missale Romanum, is identical to the form used during the time of Pope St. Gregory the Great or even of Pope St. Peter. 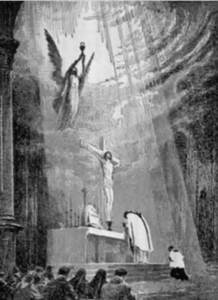 But in fact, the texts and rituals of the Roman Mass have undergone substantial changes over the centuries. These revisions can especially be seen in the various preserved sacramentaries, the name of the book that contained the prayers used by the celebrant of the Mass and for other ceremonies, and is the predecessor of the altar missal. Some of these sacramentaries compiled for the Bishop of Rome, who is the Pope, are as followed: Leonine Sacramentary, the Gregorian Sacramentary, and the Gelasian Sacramentary. While these Liber Sacramentorum have been in times past been attributed to certain popes, their actual authorship is somewhat in dispute. However, one element of the Roman Mass that did remain rather consistent was the Roman Canon, of which its standardized version was codified for the Church by Pope St. Gregory the Great about 600 AD. The word “Canon” refers to a formal order of silent prayers to be said for offering the sacrificed Body and Blood of Christ to the God the Father. The Roman Canon begins after the Sanctus with the Te igitur and encompassing the consecration goes to the Per ipsum, at which time the silence is broken for the Pater noster which begins the Communion portion of the Mass. Part of Pope Gregory’s codification of the Roman Canon included the arrangement of its prayers into the order we see today, as well as the addition of some saints’ names. He also placed the Pater noster (or Our Father) in its present place in the Mass. On this point, some historians place certain evidence that Pope Gregory even added this prayer to the Roman Mass, and not just merely re-positioned it. Beyond the Canon, various attempts were made over the centuries to conform the local variation of the Roman Mass to how the rite was celebrated in Rome, by the Pope. Consider one of the most significant elements towards the standardizing the Roman Mass: the development of the altar missal. The presence on the altar during Mass of a missal — called in the Roman Rite the Missale Romanum — is taken for granted today, but this type of book is of a rather later and lengthy development. In the early centuries of the Church, Masses were only sung and according to the Solemn form which in addition to the sacred ministers of celebrant, deacon and subdeacon, included the offices of the schola (or choir) and the master of ceremonies. Since each minister only needed to know his own part, each had his own book, thus the celebrant used the sacramentary, the deacon and subdeacon the Evangelarium-Epistolary, the schola the Graduale or Antiphonary and the MC the Ordines which contained the ritualistic instructions. 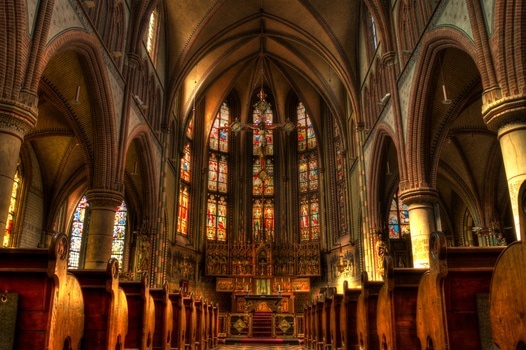 This at this time, priests would take turns offering the daily community Mass for the ecclesial community (such as in a monastery), but they didn’t usually offer their own private daily Masses, because additional ministers would be needed. Around the 10th century, the sacrificial concept of the priesthood was becoming more appreciated and recognized in the Latin Church, and thus the importance of the offering the Holy Sacrifice of the Mass in a priest’s daily life. Out of this growing awareness of the sacrificial nature of the priesthood, priests began to offer Mass privately in recited form and with just an acolyte. The following are some particular changes made to the Roman Mass over the centuries. To start out with, you might be surprised to learn about some items that are taken for granted today as part of the Roman Mass, but which were not prescribed until 1570 through the newly-codified Missale Romanum. 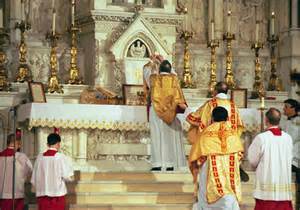 For example, the use of 3 altar cloths instead of only 2, the use of the genuflection as the form of reverence towards the Blessed Sacrament; as in many places, just a low bow was made, and how many candles were lit for a Low or Solemn Mass. Other items for the Roman Mass that came even later was the prescription for reserving the Blessed Sacrament in a tabernacle on the high altar in a parish church, the precise manner in which the altar was incensed during Solemn Mass. This ritual was not decreed until the late 19th century. Even today, there is a difference of opinion amongst rubricians about what types of bows exist (ranging from a 3-bow system to a 5-bow system), as the missal’s rubrics are not exact on this matter.